It is Sunday morning (well 11:16) and I have a conference call at noon. How will I get my post finished!!! I hear one of my elderly cats caterwauling in her guttural voice informing me that she is not satisfied with her morning meal. I feel the pressure...will I be able to finish this....need to focus...don't think about Star...ahhh...Ray just scooted her to the kitchen and is feeding her a new and different can of Fancy Feast. He tells me that they like variety and so they never get the same kind of food two days in a row. Yes, we spoil them...but they are 22 and 23 years old...so they feel they are entitled. The conference call is soon and I should get prepared. I am the secretary of a nonprofit, Cuyamungue Institute, that is based in New Mexico. 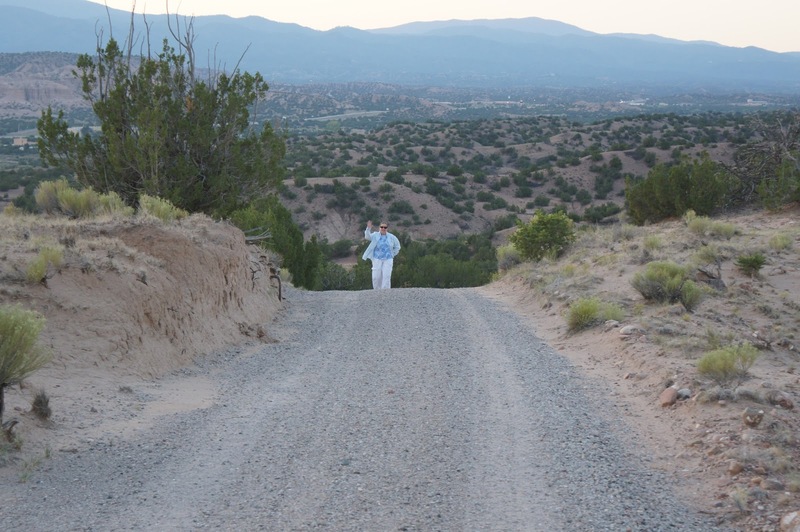 Every summer I travel to New Mexico for a board meeting and usually to present a workshop. I will write more about it in another blog. It is important to select the right words to describe the beauty of the Land and the transformation I feel every time I go there. So, instead of writing about it, this time I will share a few pictures. Sunset at Cuyamungue Walking up to the ridge to greet the sun in the morning. The road into Cuyamungue Institute The Casita and the Kiva. Those photos are incredible. What a wonderful place to retreat to! Good luck with your noontime call. Beautiful photographs! Words I loved in your post....caterwauling and guttural. 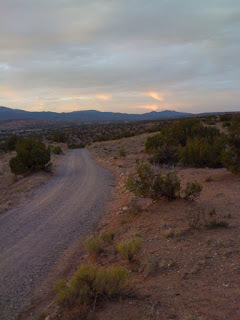 There is a reason they call New Mexico the Land of Enchantment. Your photos prove that. Really gorgeous photos. What a great place to greet the sun. Yes, we greet the sun each morning...what a great connection to the earth. First time I've read your blog. A family of storytellers--how wonderful is that! You must live out West then if you're involved with New Mexico some how. Glad you're here to share with us. Thanks, Tam, I do love the South West...but I live in Ohio. That is what makes it a special trip every year. Glad I am here to share too. This has been fun. I have never been to New Mexico, but your amazing photographs are convincing me that it should be on my list of places to visit! Thanks for sharing! 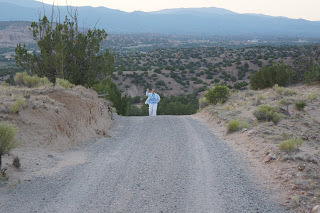 Yes, you need to visit New Mexico. These pictures don't do it justice...it is for sure the Land of Enchantment! I love your photos. It seems like such a peaceful retreat. What a great word, "caterwauling". Thanks for sharing this slice of your day. I hope the call went well. Something Fishy? A True Story!